Liberty Hill Cemetery: Here, under the moss‐covered headstones and aging oaks, you will find the names of people who once owned homes and businesses in our Historic Acworth Tour. Look for family names such as McEver, Cowen and Lemon, just to name a few. The oldest grave is dated 1821. 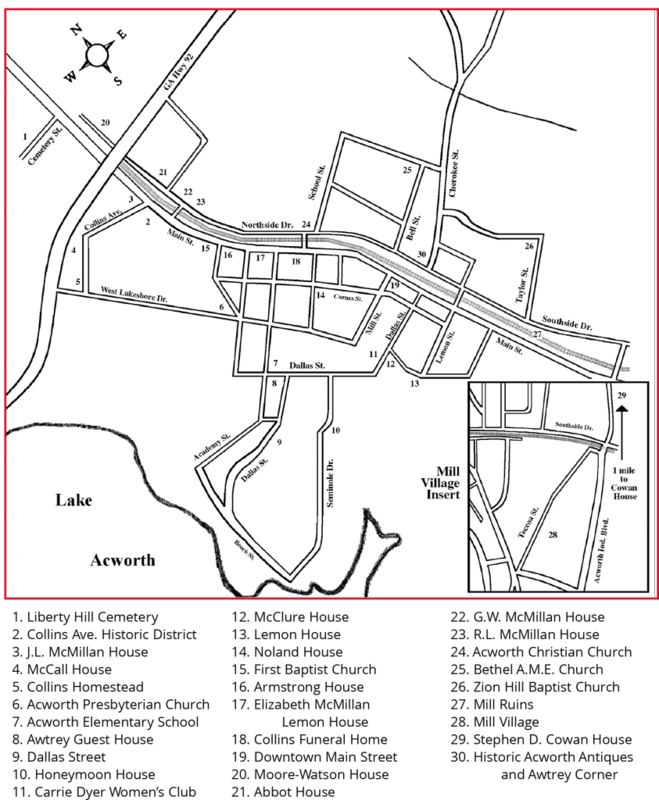 Collins Avenue Historic District: Once a 215 acre farm that spread from Main Street to present day Lake Acworth, this district is located on land that was home to John Collins, a Revolutionary War soldier, who settled in Acworth in 1833. L. McMillan House—4671 Collins Avenue: This vernacular Victorian home was built by James McMillan for his bride, Emma Alice Lemon in 1879. The architectural details exemplify the gracious lifestyle of post ‐Civil War Acworth. McCall House—4623 Collins Avenue: This Queen Anne style Victorian home showcases a hipped and gabled roof and wrap‐around porch. Originally built by the Lovingoods on Collins property as an investment, it was purchased in 1947 by the McCall family. Mr. McCall was an area physician and Ms. McCall was Acworth’s first woman mayor. Collins Homestead—4591 Collins Avenue: This home was built in the mid 1800’s and stood at the top of a rise that was once a 215 acre farm. Mr. Collins and his wife were founders of the Acworth First Baptist Church in 1840. Acworth Presbyterian Church—4561 Church Street: Built in 1875 on land donated by banker Smith Lemon, this is Acworth’s oldest religious structure. The architectural details reflect Acworth’s prosperous rebound from Civil War destruction and reconstruction challenges. Acworth Elementary School—4496 Dixie Avenue: The current‐day primary school McCall, although built in 2001, is a school that stands on the same site of previous Acworth schools since the 1850’s. Awtrey Guest House—4468 Dallas Street: This Queen Anne shingle style house was built in the 1890’s and served as a guesthouse for the Orlando Awtrey estate. The original five bedroom house has been expanded, yet still retains the original doors, trim, floors, mantle and stained glass. Dallas Street—The homes date from the 1870’s to the 1950’s. Some of the homes were farmhouses that were relocated when the Army Corp of Engineers flooded Proctor Creek to create Lake Acworth. Honeymoon House—4496 Dallas Street: Lemon Awtrey built this large craftsman‐style bungalow for his bride in 1907. This 13‐room, 5‐bath still has original stained glass, decorative shingles, transom and sidelights. Carrie Dyer Women’s Club—4535 Dallas Street: The Club was organized in 1898 and purchased this small, white house in 1910. It served as a community center, meeting place for Girl Scouts, and housed the volunteer library. McClure House—4544 Dallas Street: This house predates the Civil War and was once actually two houses that were joined. Acworth Postmaster Ruth McClure lived here in the 1930’s. Lemon House—4375 Willis Street: Built in 1856 by James Lile Lemon as a Carolina‐style modified Plantation Plain, it is constructed of heart pine, oak, and chestnut. It features a ten foot wide grand hall. The house served as Sherman’s headquarters in June of 1864. After the battle of Kennesaw Mountain the house was used as a hospital and spared the torch when Union troops burned Acworth in 1864. Noland House—4465 Carnes Street: This two story house dates back to the mid‐1850’s and is an example of the “Plantation Plain” style. The one‐story small addition once served as a private kindergarten and its original bell is still located here. First Baptist Church—4583 Church Street: The church was built on this site in 1872 but little of the original structure is visible after it’s renovation in 1940. The congregation dates back to 1840, where the first church was constructed of logs. Armstrong House—5001 North Main Street: John Armstrong built this Gothic Revival house prior to the turn of the 20th century. He is credited with building several large homes, but this is the only that remains. Elizabeth McMillan Lemon House—4965 North Main Street: This stately Victorian house was built by her three McMillan brothers. Miss Lizzie, as Elizabeth was called, raised six children in this house. Today the home is a gift shop with all rooms open for browsing. Collins Funeral Home—4947 North Main Street: This current structure was originally two houses built in the 1880’s and joined in the 1920’s. The Collins Funeral Home has the distinction of being the oldest continuing business in Acworth. Central Business District: Main Street follows the late 1700’s Cherokee Indian trading route that passed from New Echota to the Chattahoochee River. It later became a part of the Dixie Highway. Most of the buildings on Main Street were built in the early 1900’s. Moore‐Watson House—4784 Northside Drive: Built in 1848, this Gothic Revival home has a steep pitch side gabled room and rearward shed extension. It features arched windows and the porch has square columns with arch detail, scroll brackets and balusters. Abbott House—4610 Northside Drive: The construction of this Greek Revival house was begun before the Civil War but completed aft The house now serves an event hall. W. McMillan House—4588 Northside Drive: George Washington McMillan came to Acworth to seek his fortune, opening a brickmaking business. McMillan was named mayor four times. R.L. McMillan House—4572 Northside Drive: Robert McMillan was a partner in the McMillan Brothers store, then also a mayor and city councilman. This house, built in the early 1900’s combines elements of both the Victorian era and early Arts and Crafts movement detailing. Acworth Christian Church—4476 Northside Drive: The membership organized this church under the name of Mt. Zion Church of Christ in 1858. After a series of fires over the years, the current structure remains and is one of the five turn‐of‐the‐century churches in Acworth. Bethel A.M.E. Church—4683 Bell Street: Built in the 1870’s, this is a Romanesque Revival style. The two bell towers added in 1895 are of differing heights, both with octagonal steeples. This building has witnessed continuous Sunday services since its founding. Zion Hill Baptist Church—4255 Taylor Street: The church was first organized in 1864, moving to the current location in 1914. It has a strong relationship with Bethel A.M.E. and they often hold joint services. Old Mill—4271 Southside Drive: This is Acworth’s oldest commercial structure built by John Cowan. It began as a flourmill, then became a tapestry‐weaving mill until a fire in the early 1990’s. Mill Village—Clarksdale Drive: Orlando Awtrey founded the cotton manufacturing company in 1905 until the Sill sisters purchased it and changed the name to Acworth Mills. The sisters built the Eli Whitney School for the mill children and made many improvements to the village. Clark Thread purchased the mill in 1947 and merged to form Coats and Clark. The mill is still in use today as a printing plant. Stephen D. Cowen Farmstead—4940 Cowan Road: This 1854 farmstead is one of Cobb County’s few remaining Plantation Plain style houses. This house in an excellent example of this style: two‐stories tall, one room deep and a gabled addition. Historic Acworth Antiques and Awtrey Corner— Corner of Cherokee, Northside and Southside Streets: The Historic Acworth Antiques building was built in 1894 and once housed a hardware store. Across Cherokee Street is Awtrey Corner, built between 1870 and 1890 as the original planned commercial district. It was originally a mercantile store, but later became a buggy factory, hardware store, mortuary and a stuffed toy manufacturer. The façade is nearly the same as 100 years ago.